Hello everyone! I am about to leave now to celebrate with my family because today is Mother's day which, I know, you guys know. 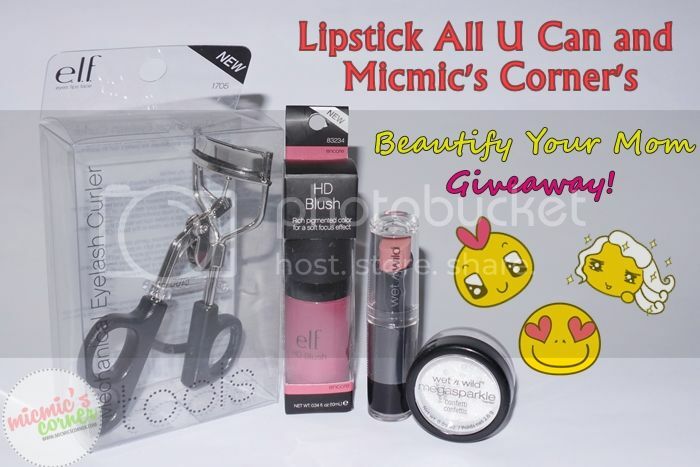 But before doing so, I want to do a quick post about this giveaway the is sponsored by Lipstick All U Can. Our mom's are the busiest persons in the world. I should know because my mom is always working, in her business and here in our house. She sleeps for less than 6 hours only. All the time, she thinks first of our welfare and interests than hers. So, to give back to the busy moms out there, this giveaway is conceptualized and now, being posted. Don't get me wrong. I find all moms to be beautiful in their own little ways but sometimes (or most of the time) they neglect their own beauty just to take care of us, their families. The prizes for this giveaway will help them enhance their own beauty. The Rafflecopter widget is provided below for your use. Please follow the instructions carefully. This is open to Philippine-residents only and will run for a month. That's it. I hope you enjoy this giveaway as there will be more in the future. God bless and Happy Mother's Day to my mom and to all mother's out there. May you have a wonderful day spent with your loved ones.